Our Illinois teams had another outstanding day at the 2019 Chipotle-USA Hockey National Championships, winning 10 of 11 games played. The Chicago Mission 15 Only team went undefeated in pool play and has advanced to the Tier I 15 Only Youth quarterfinals. They will face the Phoenix Jr. Coyotes at 2:15pm (EDT) for a chance to move on to the semifinals. Click HERE for the National Championships schedule or download the Nationals App from the Apple Store or Google Play. You can also watch all games LIVE on HockeyTV. 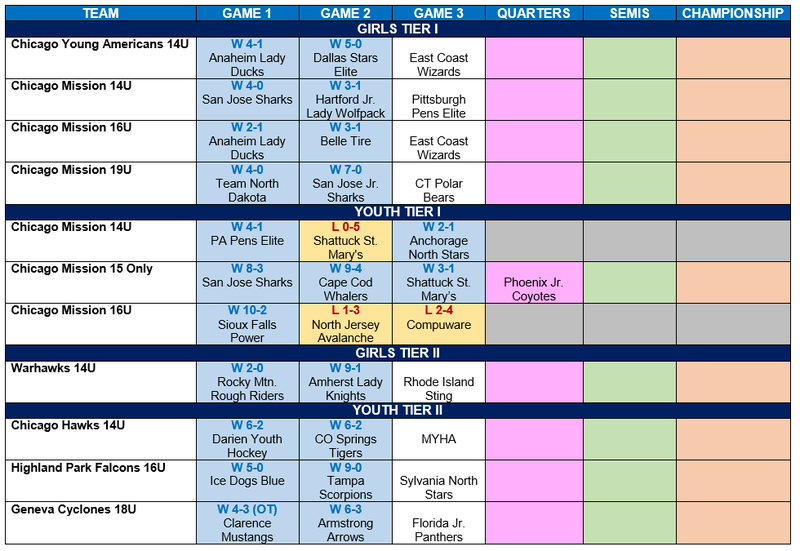 Our Tier I and Tier II Girls and Tier II Youth teams will complete pool play on Saturday, April 6th. All the aforementioned teams remain undefeated after two games and have high hopes of advancing to their respective quarterfinal rounds. Please see below for a complete wrap-up of today’s games. Good luck teams!! !